The machine for the established hobbyist with a passion for quilting. The standard package of this machine includes both the Walking Foot and the BERNINA Stitch Regulator, making it the perfect match for you as a quilter. The extensive range of available BERNINA accessories offers you the choice of expanding your creative options. Experience other sewing specialties such as heirloom, home decorating, crafting and garment sewing with the Bernina 550 QE. Easy Navigation: You’ll appreciate the user friendly features and simple interface. The crisp LCD displays all your settings at a glance. The built-in Sewing Consultant is ready to assist you at anytime. BSR functionality (BERNINA Stitch Regulator): The BERNINA Stitch Regulator (BSR) is designed to assist you in mastering free-motion techniques by keeping stitches consistent at variable sewing speeds. The BSR offers confidence for the beginner and additional insurance for the experienced quilter. The BSR comes standard with the B 550 Quilters Edition. 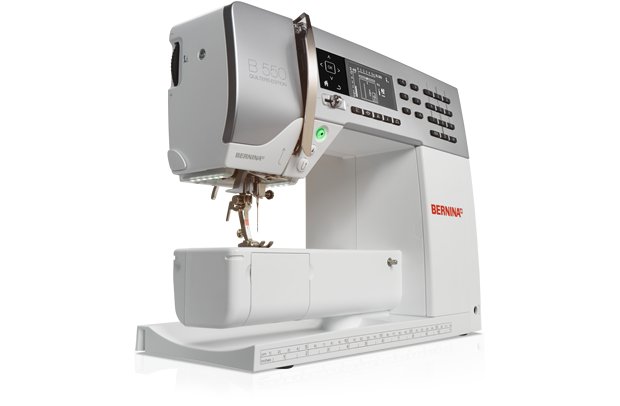 Total Stitch Control: The BERNINA 5 Series provide an exclusive level of stitch control. Whether altering the stitch length (up to 5 mm), width (up to 5.5 mm) or needle position (up to 11) or even creating custom combinations, you’ll appreciate the convenience of a machine that remembers the stitch details for you. Semi-automatic needle threader: The practical semi-automatic needle threader lets you start sewing faster. Memory: Let your BERNINA keep track of the details with multiple memory functions. It remembers the changes you make to the stitches as you use them in your sewing session. It will also remember your favorite stitch settings for each stitch when saved in a long-term memory. For creative applications, you can save up to 100 stitches in a combination. Extensive Stitch Library: A library of over 140 stitches are included, conveniently stored by category for a wide variety of applications. You can view and select stitches directly or use the easy-to-navigate screen. Whatever your sewing project, you’ll find the perfect stitch. Automatic buttonhole: With the one-step automatic buttonhole function you will have consistent buttonhole length time after time. Reverse sewing: The Quick Reverse button enables quick and easy temporary and permanent reverse sewing. Start/Stop button: Use the convenient start/stop button rather than the foot control for convenience or comfort. Slide Speed Control: With the aid of the easy-access speed control, sewing speed can be tailored to the individual project – slow for precise work, faster for general sewing projects. Thread tension: Consistent thread tension for various fabrics and techniques. Adjustments can be made easily with the readily accessible tension dial. Two Spool Holders: The vertical, fold-out second spool holder is especially practical when winding bobbins or when using twin needles. Thread Cutter: Three conveniently located thread cutters save time. LED Sewing Light: The especially bright LED light provides optimum illumination of your work area. Extension table: The included practical extension table is simple to attach and offers ample space to hold your larger sewing projects.